As most everyone knows, the forty days of Lent reflect, in part, the forty days our Lord Jesus spent in the wilderness at the outset of his public ministry (Matthew 4:1-11; Mark 1:12-13; Luke 4:1-13). During that time he fasted, prayed, and was tempted by the devil. Because Jesus fasted during this time, the practice of fasting has become associated with the season of Lent. What I’m offering here is a “primer” on Lenten fasting. If you have never fasted during Lent, or are a bit fuzzy about this practice, then you might gain some clarity by reading on. The first practical thing to notice about a Lenten Fast is that the season of Lent is actually forty-six days long. That is because Sundays are always a celebration of the Resurrection of Jesus and considered “feast days.” Therefore a Lenten Fast does not include Sundays. When you subtract the Sundays from the season of Lent you are left with forty days. These are the days on which you fast. Whatever you have given up for your Lenten fast may be enjoyed on Sundays without breaking the fast. There are different kinds of fasts. To “fast” is to abstain from something. Normally we think of food, but actually you can fast from just about anything. You might decide to fast from television, or video games, or romance novels, or comic books, or facebook, or a facebook game, and so on. Food is just one option. Fasts can also be “complete” and “partial.” A partial fast does not completely cut you off from whatever you are fasting from. Let us take television as an example. You might decide to “fast” from your favorite sit-com, but still watch news. With computers, you may decide to fast from facebook, but still use your e-mail. With food you may decide to fast from desert, but still eat dinner. A complete fast is just what it sounds like. You abstain from all food. You abstain from all television. You abstain from all computer activity. You get the idea. If fasting is not a current part of your life, I recommend starting with partial fasts. Fasting, in and of itself, is not a useful spiritual discipline. Simply abstaining from food (say meat), or avoiding romance novels, or not drinking alcohol, does not make you a stronger Christian. In other words, such abstinence is not a “means of grace.” It can, however, help you gain some control over your body. What fasting can do is remind us that “man does not live by bread (computers, television, etc.) alone, but by every word that comes from the mouth of God” (Matthew 4:4). That “word … of God” is a means of grace. Fasting can free up time for things like reading the Bible or some book that is biblically based. You may decide to read through the Lutheran Confession during Lent. You may want to set aside time, each day, to ponder the Small Catechism. You may want to take time to memorize the Catechism or some other portions of Scripture. You may wish to ponder the hymns in our hymnal. You may want to read one or more of the Pastor Stephen Grant novels and ask yourself what spiritual truths he is presenting in these fast-paced action thrillers. You may want to take time each day to remember the members of Our Redeemer in your prayers, or the general ministry of Our Redeemer. You may want to pray for pastor, his sermon preparation, and so on. You may want to pray for each of your neighbors. You may wish to develop the practice of praying through the newspaper, using each story as a springboard to a prayer topic. You may wish to use your “extra” time to volunteer somewhere, like the Orphan Grain Train. You will certainly want to use some of that “extra” time by attending worship opportunities, like our Wednesday Lenten services, and our special Holy Week services. These are just a few ideas. 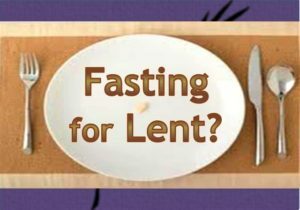 I hope this little Primer on Lenten Fasting has been helpful. I’ll see you in Church. If you like this post, why not share it?